Collins Booksellers - Florida Pharmacy Law by Maryam M. Khazraee, 1230000815796. Buy this book online. New and updated Florida Pharmacy Law written by a Florida registered pharmacist that passed the FL MPJE with flying colors! This is a comprehensive, easy-to-study guide to current federal and Florida pharmacy law. It is designed to help you review the most important federal pharmacy statutes and regulations, including the newest changes that no other book currently reviews to ensure you have the most recent laws to study from. 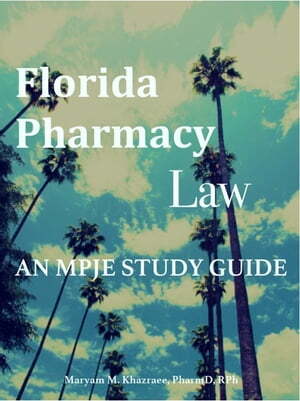 This book is designed to assist candidates in preparing for pharmacy law examination in Florida. It also includes over 150 practice federal and Florida law questions and answers. Best of all, it's affordable for a student's budget or professional seeking licensure in the state of Florida!